Mesh architectural hints with natural shapes in your garden by adding these Gardman Aged Bronze Nature Garden Trellises to it. Using metal trellises in your yard brings individual style to it, while also helping your plants grow upright. Round, 0.25" diameter metal rods form the frame of each of these 2, intricate trellises, and their aged bronze color adds dimension to your garden. Scrolls rest in the center of this frame, surrounded by a wealth of twig, leaf, and bird figures. The top of the arch extends above the sides slightly for added height, and a horizontal rod visually divides the top from the rest of the panel. The two legs of each unit insert into soil easily, while brown and black hues add depth. Crafted from metal, these trellises are sure to remain lovely and durable in your yard. Celebrate nature in a few ways by placing these Aged Bronze Nature Garden Trellises in your yard. 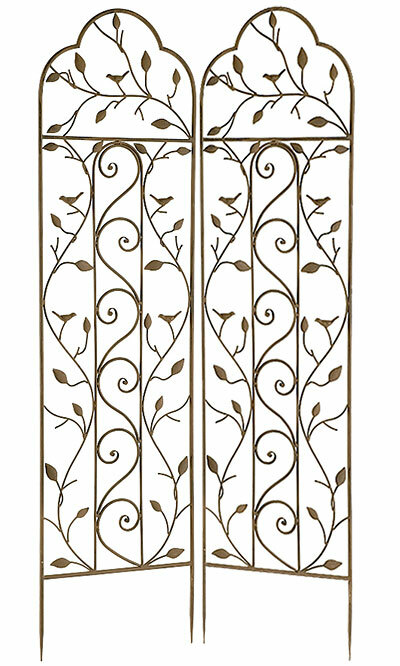 Note: This case pack includes 2 of the Gardman Nature Garden Trellises, Aged Bronze, 58"H.